Passionate shoppers will be right at home in Munich. Here are the main parts of the city you’ll want to hit up to burn some cash. Munich’s main shopping axis is impossible to miss. 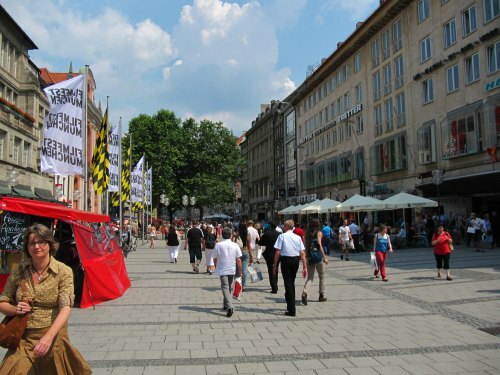 The pedestrian zone runs from Karlsplatz through to Marienplatz and is usually packed, so be prepared to walk slow or do some side stepping. Huge department stores Galleria Kaufhof and Karstadt battle for space with multinational fashion chains like H&M, Zara and C and A. A gentleman’s highlight is Hirmer, the world’s biggest men’s fashion house. On Neuhauser Strasse. Munich’s main pedestrian zone has a heap of high street shops. If money’s no object this is the street to cruise. One of Munich’s grandest boulevards, Maximillian Strasse stretches from the National Theatre up to the Bavarian parliament, the Maximilianeum lording on a hill on the eastern bank of the Isar River. High-end luxury stores like Armani and Bulgari can be found here. Don’t miss a wander through the Maximillianhöfe, a new shopping centre filled with luxury boutiques and the state opera’s rehearsal stage. 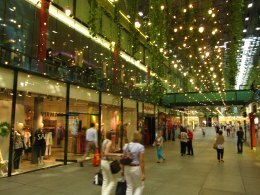 Inside the elegant Fünf Höfe shopping arcade. Another well-to-do shopping destination arching from Marienplatz to Odeonsplatz. The highlight here is the Fünf Höfe (Five Courtyards) shopping arcade with its chic cafes, clothes shops and postmodern public spaces. Laid-back and full of surprises, this is one of my favourite strips to stroll if I’ve got some time to kill in central Munich. There are many independent shops, cafes and even a few art galleries tucked away back in arcades that you have to scout around for. The shops at the southern end near the Sendlinger Tor and particularly interesting – there’s a tea shop, a few gift shops and even a shop dedicated to witches’ needs! There are plenty of intriguing shops around Sendinger Strasse / Kreuz Strasse, including Surja’s Hexenladen (Witches’ Store) and the wonderful gift shop Pappnase & Co. The legions of Munich’s yuppies hang out in the coffee bars and boutiques of Leopold Strasse, Schwabing’s main drag. Make a caffeine stop here and indulge in a spot of people watching, and then explore a few side streets. My favourite is Hohenzollern Strasse, packed with antique shops, boutiques and independent art galleries. The city’s grand outdoor market with hundreds of food, flower and gift vendors. For a full review check out my page on the Vikualienmarkt here. Munich has two grand old delicatessens which have been serving Bavarian royals and ardent gourmets for donkey’s years. The more accessible is Dallmayr, just north of Marienplatz. It’s manned by an elegant army of blue dressed/white aproned ladies and stocks everything from coffee and chocolate to sushi, sweets and Black Sea caviar costing €100s for a matchbox full. Don’t miss the stone fountain with its pool populated with living crabs! There’s also a café and fine dining restaurant upstairs. Inside Munich’s Dallmayr. From left: Caviar goes for up to €200 per 100g, chocolates for every persuasion, and cakes, cakes, glorious cakes! 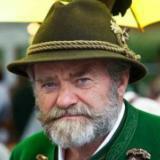 • Find out about Munich's top 10 sights at Tourist Attractions Munich. • Or jump from Shopping in Munich back to the Destination Munich homepage.